The King of Cups is a card in the tarot that shows generosity, control, and emotional balance. The card itself depicts a king seated on a throne, who has an amulet that is shaped like a fish. The fish in his necklace represents his creativity and spirit, which thrives on the calm waters that surround him. We can see from the background that there is a steady balance between the conscious and unconscious. Behind the king, there is a fish jumping out of the ocean on the right side, and a ship on the left side, representative of the emotional and material worlds respectively. The King of Cups shows that you do not suppress your impulses, but have learned to deal with them in a balanced manner. The King of Cups is one of the most influential cards in the suit of Cups. He represents creativity, emotion, and the unconscious. The card shows the ability to restrain one's emotions and be fully in charge of your feelings and impulses. 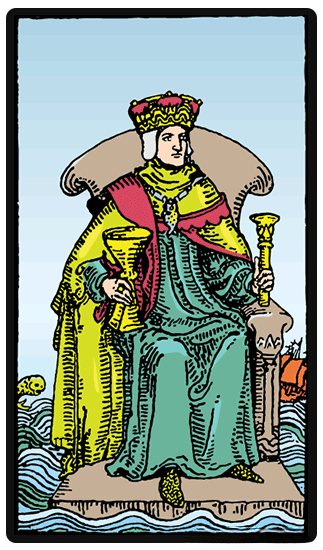 Therefore, the King of Cups represents a balance between the intellect and emotions. He indicates that there is a strong relationship between understanding and feeling. The King of Cups represents a balance between the intellect and emotions. He indicates that there is a strong relationship between understanding and feeling. When you have balanced your emotions and are able to control them, it means that you have a deeper knowledge and awareness of yourself. When you are faced with challenges that would normally throw you off balance, the King of Cups is there to remind you that you should act as he does - do not fly out in a rage, or immediately throw yourself into despair! You first need to temper the state of your emotions, so that you can progress forward in reality. Learn to evaluate yourself so as to determine how you can create a stronger awareness of your own internal state. There are instances when the King of Cups can symbolize an older male who is in your life. This is a mature man who is willing to take responsibility for his actions and has mastered his own self-understanding. The King of Cups tends to be political and diplomatic, and this makes it possible to for him to balance the needs of others, and enhance the harmony among all parties involved. The King of Cups shows that you are sensitive as a leader and you are careful with the way others respond to your emotional needs. The King of Cups implies that you should remain mature when dealing with negative energy. The King of Cups reversed signals what happens when he is at his worst: volatility, emotional manipulation and moodiness. When the King of Cups falters, his usual ability to handle situations with compassion and wisdom are turned upside down. He is unable to balance the needs of all that seek his guidance, and while appearing kind to some, may be cold to others. His talent in navigating the emotions of others may be put to dubious uses, manipulating circumstances to fit his needs. The reversed King of Cups suggests that there is a character in your life that is depicted by this card, whether a part of you or someone else. While he is normally very in touch and controlled with his emotions, he has lately become manipulative and emotionally controlling. His actions will be used for vengeance and vindication, impulses that he normally has under control, and is eventually aimed at being some form of punishment.